Inspirational Rosa Parks Quotes from YummyQuotes.com! 55 Rosa Parks quotes to inspire you! On the first day in December, 1955, Rosa Parks took the bus home from work—and changed history. Rosa, an African-American, refused to obey the white bus driver’s order to give up her seat to make room for a white male passenger. Back then, the law segregated black people and white people in virtually every aspect of daily life in the southern United States. So bus and train companies enforced separate seating sections for blacks and whites. Black people could sit in the middle rows—until the white section was full. Then they had to move to seats in the back, stand, or get off the bus. On that day in 1955, Rosa had taken her seat in the front of a “coloured” section, and became one of four black people ordered to move to make room for a white man who got on the bus after her. When she politely but firmly refused, a police officer arrived to arrest her. Although widely honoured in later years for her action, at the time it cost Rosa her job as a seamstress in a local department store. But she was a woman who believed in standing up for justice. That's why Rosa Parks quotes are so popular. Rosa's peaceful act of defiance led to a bus boycott by united black citizens that lasted for 381 days. Dozens of public buses stood idle and empty, and the bus transit company lost money. Finally, the law requiring segregation on public buses was lifted. 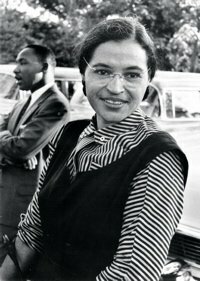 Rosa became an international icon of resistance to racial segregation. She organized and collaborated with civil rights leaders, including Martin Luther King, Jr., who led the bus boycott. U.S. Congress later dubbed her the "Mother of the Modern-Day Civil Rights Movement." Rosa died in 2005 at the age of 92. 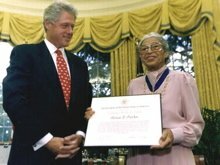 Among other honours she received, city officials in Montgomery and Detroit reserved the front seats of their buses with black ribbons until her funeral. Now you know Rosa's story , let her quotes inspire you to stand up for what’s right! - There was no plot or plan at all. I was just tired. - All I was doing was trying to get home from work. - Our mistreatment was just not right, and I was tired of it. - I felt a determination cover my body like a quilt on a winter night. - I knew someone had to take the first step and I made up my mind not to move. - I hope people understand I did what I did not to make trouble or attract attention. But I would do the same thing again. - Somebody has to say "Stop!" some time, and that seemed to be the right station to stop the constant harassment and find out which human rights I was entitled to. - People always say that I didn't give up my seat because I was tired, but that isn't true. I was not tired physically, or no more tired than I usually was at the end of a working day. I was not old, although some people have an image of me as being old then. I was 42. No, the only tired I was, was tired of giving in. - I didn't feel very good about being told to stand up and not have a seat. I felt I had a right to stay where I was. That was why I told the driver I was not going to stand. I believed that he would arrest me. I did it because I wanted this particular driver to know that we were being treated unfairly as individuals and as a people. - Of course, when I refused to stand up, on the orders of the bus driver, for a white passenger to take the seat, (and I was not sitting in the front of the bus, as so many people have said, and neither were my feet hurting, as many people have said), but I made up my mind that I would not give in any longer to legally imposed racial segregation. - I did not get on the bus to get arrested. I got on the bus to go home. - It was the first time I'd had that particular thing happen. I was determined that I let it be known that I did not want to be treated in this manner. - I didn't feel good about going to jail, but I was willing to go to let it be known that under this type of segregation, black people had endured too much for too long. - I did feel determined to take this as an opportunity to let it be known that I did not want to be treated in that manner and that people have endured it far too long. However, I did not have at the moment of my arrest any idea of how the people would react. - After I was in jail I had the opportunity to call home and speak to my mother. The first thing she asked me was if they had attacked me, beat me. That's what they used to do to people. I said no, that I hadn't been hurt, but I was in jail. She gave the phone to my husband and he said he would be there shortly and would get me out of jail. - Two policemen came on the bus and one asked me if the driver had told me to stand and I said, "Yes." And he wanted to know why I didn't stand, and I told him I didn't think I should have to stand up. And then I asked him, why did they push us around? And he said, and I quote him, "I don't know, but the law is the law and you are under arrest." - I had no fear at that particular time. I was very determined to let it be known how it felt to be treated in that manner—discriminated against. I was thinking mostly about how inconvenienced I was—stopping me from going home and doing my work—something I had not expected. When I did realize, I faced it, and it was quite a challenge to be arrested. I did not really know what would happen. I didn't feel especially frightened. I felt more annoyed than frightened. - As I look back on those days, it's just like a dream. The only thing that bothered me was that we waited so long to make this protest and to let it be known wherever we go that all of us should be free and equal and have all opportunities that others should have. - My arrest brought about the protests for more than a year. And in doing so, Dr. Martin Luther King became prominent because he was the leader of our protests along with many other people. And I'm very glad that this experience I had then brought about a movement that triggered across the United States and in other places. => For Martin Luther King Jr.'s point of view of the Montgomery bus boycott, please click here. - Each person must live their life as a model for others. - I find that if I am thinking too much of my own problems and the fact that at times things are not just like I want them to be, I do not make any progress at all. But if I look around and see what I can do, and then I do it, I move on. - I remember going to sleep as a girl hearing the (Ku Klux) Klan ride at night and hearing a lynching and being afraid the house would burn down. - When I was a young child I couldn't understand why black people weren't treated fairly. But when I did learn about it, I didn't feel very good about it. - We didn't have any civil rights. It was just a matter of survival, of existing from one day to the next. - I always felt badly because our people were not treated fairly. We should have been free and given the same opportunities others had. - I think it would be a good thing if all people were treated equally and justly and not be discriminated against because of race or religion or anything that makes them different from others. - Back in Montgomery during my growing up there, it was completely legally enforced racial segregation, and of course, I struggled against it for a long time. I felt that it was not right to be deprived of freedom when we were living in the Home of the Brave and Land of the Free. - We should all be free people and we should have the same rights as other people. In the South, at that time, there was legally enforced segregation. There were places black people couldn't go, and rights we did not have. This was not acceptable to me. A lot of other people didn't disobey the rules because they didn't want to get into trouble. I was willing to get arrested—it was worth the consequences. - I think it's important to believe in yourself and when you feel like you have the right idea, to stay with it. - Stand for something or you will fall for anything. Today's mighty oak is yesterday's nut that held its ground. - I have learned over the years that when one's mind is made up, this diminishes fear; knowing what must be done does away with fear. - Usually, if I have to face something, I do so no matter what the consequences might be. I never had any desire to give up. I did not feel that giving up would be a way to become a free person. That's the way I still feel. By standing up to something we still don't always affect change right away. Even when we are brave and have courage, change still doesn't come about for a long time. - I would like to be known as a person who is concerned about freedom and equality and justice and prosperity for all people. - I want to let you know that all of us should be free and equal and have equal opportunity. And that is what I'm trying to instill and encourage, and inspire young people to reach their highest potential. Memories of our lives, of our works, and our deeds will continue in others. - We still have a long way to go, we still have many obstacles and many challenges to face. It's far from perfect, and it may never be, but I think as long as we do the best we can to improve conditions, then people will be benefited. - I think when you say you're happy, you have everything that you need and everything that you want, and nothing more to wish for. I haven't reached that stage yet. - My mother taught me to read even before I began school. - Raymond, my husband—he is now deceased—was another person who inspired me, because he believed in freedom and equality. - My mother was a teacher in a little school, and she believed in freedom and equality for people, and did not have the notion that we were supposed to live as we did, under legally enforced racial segregation. She didn't believe in it. - I set examples by the way I lead my life. - I believe in peace too, and not violence. - I do the very best I can to look upon life with optimism and hope and looking forward to a better day. - I try to not think of those things that we cannot control, but I think if we continue to work with positive attitudes, conditions will be better for more people. - Have a spiritual awareness, because I feel that with the spirit within and our belief in ourselves and our faith in God that we will overcome many obstacles that we could not with negative attitudes. I want to always be concerned with being positive. - It pains me that there is still a lot of (Ku Klux) Klan activity and racism. - Have you ever been hurt and the place tries to heal a bit, and you just pull the scar off of it over and over again. - I wanted to be free as everybody else. I didn't want to be constantly humiliated for something I had no influence on: the colour of my skin. - People need to free their minds of racial prejudice and believe in equality for all and freedom regardless of race. We need much more education—especially those who are narrow-minded. - I didn't think that we should have to be treated the way were, just for the sake of white supremacy, because it is designed to make them feel superior, and us feel inferior. That was the whole plan of racially enforced segregation. - I don't think well of people who are prejudiced against people because of race. The only way for prejudiced people to change is for them to decide for themselves that all human beings should be treated fairly. We can't force them to think that way. - I urge children to have a spiritual awareness in their lives. If children work towards a positive goal in life, it will help them be successful when they become adults. - We have so many broken homes now. Young people need some means of being encouraged and to try to find some role models, people in school, in church, and other organizations. They need to be organized to work together, instead of being so scattered about and not having any positive outlook on life. - I always encourage children to stay in school, get good grades, and to believe in themselves. Of course they should take care of their health and keep themselves from certain things that would be detrimental to them either physically or mentally. They should be sure to get the best education that they can and choose careers that they can be progressive in as they go into their adulthood. - The advice I would give any young person is, first of all, to rid themselves of prejudice against other people and to be concerned about what they can do to help others. And of course, to get a good education, and take advantage of the opportunities that they have. In fact, there are more opportunities today than when I was young. And whatever they do, to think positively and be concerned about other people, to think in terms of them being able to not succumb to many of the temptations, especially the use of drugs and substances that will destroy the physical health, as well as mental health.